The theme for this month's Paper Smooches challenge is "fun." I went with a summery theme on my card for the challenge using a layout from the current Fab Friday challenge. I used a pair of small circle punches to make an irregular wave-like border along the top of a dark blue cardstock strip. After edging the straight side with a narrow strip of red cardstock, I adhered the wavy strip to a light blue card base. The "waving hello" sentiment from the Wicked Nauticool set was stamped on the strip in white pigment ink, then heat embossed. I wish I'd stamped it just a bit more to the right ... The sailboat from the Wicked Nauticool set, colored with Copic markers and cut out with the coordinating die, was added to the other end of the wavy strip with foam tape to complete the design. Looks totally fun to me! 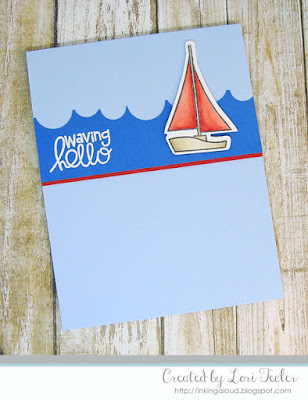 Love that wavy edge you created with the punches, and your coloring of that sailboat is spot on. Bring on summer! Thanks so much for playing at Fab Friday!